Since 1937, island folks have welcomed visitors into their homes. In that tradition, the Roanoke Island Inn - welcomes you. Originally a small, simple island house, it was built for the current innkeeper's great- great- grandmother in the 1860s. The house was enlarged soon after the turn of the century and has continued to grow with each generation. In its present incarnation, THE ROANOKE offers its guests the privacy of outside entrances, the comfort of a lobby and the indulgence of a well-stocked innkeeper's pantry. A second floor porch overlooks the Roanoke Island Marshes Lighthouse and Manteo's acclaimed Waterfront where visitors can stroll along the boardwalk to shops, restaurants, charter boats, and the movie theater — all the quaintness and friendliness that a small town can offer. Bikes are by the picket fence for exploring. 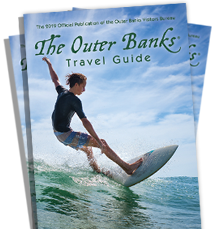 And the beaches, lighthouses, and sun-filled activities of the Outer Banks are just across the causeway. Perhaps you'd rather sit by the Koi pond with a good book. After all, it's your vacation.